Backed by the dedicated team of our skilled professional, we are offering an extensive range of Braille Labels. Specialising in the production of labels and multi-page labels for the Pharmaceutical industry, Unick's expertise includes offering a wide variety of added value finishes and features. Helping our client base conform to legislative and consumer demand our production methods conform to ISO 9008:2001 regulations. 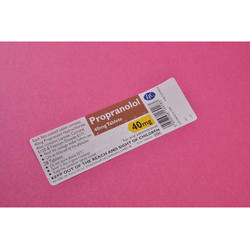 We are offering an extensive range of Braille Labels. 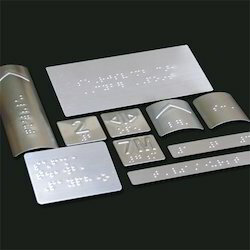 Our organization involved in manufacturing and supplying of an all-encompassing range of Braille Labels. Our organization is indulged in offering Braille Label to our clients. These are available in attractive colors, shapes, print, dimension and finishing according to the client specific demands. These Braille Labels are available a market leading prices. We made custom braille signage on acrylic ABS, and aluminium material cost of braille signage depend on Dot and material. We manufacture Braille Signs in multi colours for the use in School, Colleges, Govt. Offices, Hospitals etc. Having years of experience, we are offering a wide array of Braille Labels. Specialist printers for braille labels stickers for an extremely wide range of customers across many industries. Digital Braille printing has been introduced for the first time in India by Chanakya Mudrak! State of the art technology is used to print braille on sighted text. Braille text can now be printed over pre-printed data which makes it possible for a sighted person as well as a visually impaired person to read it simultaneously. Our Braille Labels are made of premium quality materials. Jk Fine Prints Pvt. Ltd.